Supervisors, safety directors and HR professionals are encouraged to attend this training. Attendees will learn to identify substance abuse indicators and to successfully address workplace substance abuse and impairment. 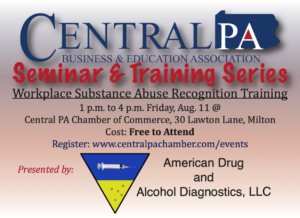 Topics to be addressed include: workplace drug policy requirements, medical marijuana, the new OSHA rule on post-accident testing and prescription medication concerns. This training is important for any company with a workplace testing program (e.g. restaurant, factory, construction company, warehouse) but also mandatory for those with CDL drivers, such as municipalities, trucking and transportation companies, etc.